Paradise Recording, Santa Cruz CA: SambaDá and Ile Aiye Bahia 2009! What a dream! 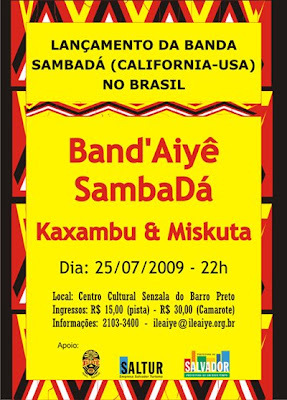 Today I was on the phone with the founder of Ile Aiye, Vovô... who is helping put this show together, and also getting our whole band to get from São Paulo to Bahia. It is a total dream come true. We are leaving Tuesday, and today I made a couple of mixes of songs that I never really finished, which I started in Bahia, February 2008. I have been working quite hard since then in the studio on many projects, so never had a real chance to turn one of these songs out. I am trying to repair a hard drive recorder to bring down to dandha's brother... we will see what happens! SambaDá is going to play a benefit on Saturday night at Moes Alley in Santa Cruz to raise money for the trip.